Advertising on Amber Sound 107.2FM strengthened our brand and increased footfall. People from many walks of life mention our campaigns with the station and from a business point of view the station certainly has our interests at heart looking all the time to hit our bottom line. We will be happy to continue our relationship with the station in the future. 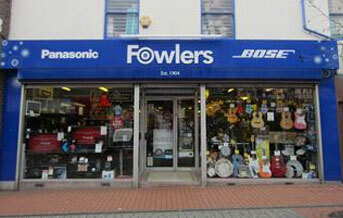 Fowlers of Ripley are a retail outlet based in the centre of Ripley. The business has two sides that being audio / visual alongside musical instruments. Their main brand names are Panasonic and Bose along with subsidiaries Denon and Yamaha. Fowlers use Amber Sound 107.2 to promote specifically dated special offers from their suppliers and often get the supplier involved to help with the cost of the promotion.This tends to result in two to three campaigns per year specifically targeting special offers from suppliers. An example of this is around Christmas time when Panasonic decided to run a special marketing campaign on a new range of large screen plasma TV’s. This was the first time that a large format plasma had been produced with a built in satellite receiver and Panasonic coupled this launch with a free five year warranty. The campaign ran from October through until New Years Eve seven days per week.